The Route 9 corridor between South Toms River and Tuckerton Borough in Ocean County is a two-lane rural roadway which runs parallel to the Garden State Parkway and provides the only alternate north-south route in the county. Route 9 serves as an important connection among the various townships and boroughs along the Atlantic shore. Over the last 20 years, Route 9 has experienced rapid suburban development and tourism related pressures that have created tremendous traffic congestion and safety concerns along the corridor. 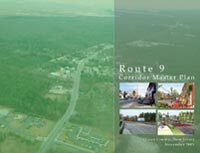 The Route 9 Corridor Master Plan provides descriptions, detailed recommendations and example design illustrations to support each principle throughout the corridor. Twenty-four specific action items to reduce the congestion and improve the safety on Route 9 as well as to enhance the quality of life for residents along the corridor are grouped into four different categories (network enhancements, transit enhancements, roadway improvements and land use modifications) and provided as a conclusion to the Master Plan document. The Route 9 Corridor Master Plan and a Route 9 Corridor Coalition Agreement for voluntary participation by corridor municipalities in plan implementation were completed in 2005. Berkeley Township is advancing its Master Plan for development of a town center along Route 9. Improvements for the intersection of Route 9 and Ocean Gate/Korman Roads were completed in 2010. Final design plans for the Route 9 and Lacey Road intersection have been completed. The Route 9 Corridor Master Plan is well into implementation.